Between 1862 and 1976 1.1 million ounces of gold were mined from 64 gold districts throughout Nova Scotia. These hard rock gold mines were among the earliest in Canada, preceding by decades all but British Columbia’s major gold discoveries. 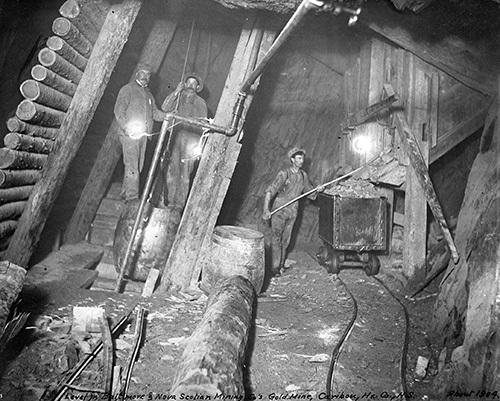 Many Canadian gold mining techniques were pioneered in Nova Scotia, and the mines themselves drew international attention. Despite this early start and the fact that these mines were the training grounds for many men who went on to work the more famous gold fields (including NS prospector Robert Henderson, co-discoverer of gold in the Klondike), the story of gold mining in Nova Scotia is one that has been all but buried. Use the tabs on the left to explore the story of Nova Scotia gold mining past and present. A special thanks goes out to the contributors to the exhibit who made this content possible.